NT Connections claims to be the largest youth theatre festival in the world. It’s certainly hard to think of anything comparable. In 2016, it involved 10,000 young people. It’s also a fine example of the National Theatre living up to its name because the scheme really does operate nationwide. I saw and enjoyed Blackout by Davey Anderson, one of this year’s Connections plays, at the Marlowe Theatre, Canterbury in April. It opens with a group of teenagers staring balefully at their phones – then the story of a misunderstood boy who finds himself in trouble unravels. I could have seen this sparky 40-minute piece, inspired by a real incident in Glasgow, at Aberystwyth Arts Centre, Brewery Arts Centre Kendal, Lyric Theatre Belfast, Norwich Playhouse – or any of the scheme’s 40 partner venues across the UK. The National commissions new work for Connections from eminent playwrights every year. For 2016 that included Mark Ravenhill, Simon Armitage and Partrick Marber. A bumper 12 plays were commissioned for 2016, the 21st scheme since it was founded in 1996. In previous years it had been six. For 2017, 10 have been commissioned. This project has generated a lot of work for playwrights over the years – 150 plays so far – and continues to do so. Of course, some of these plays have a life beyond Connections, Philip Ridley’s Sparkleshark (1997), for instance. The National produced a professional production which also toured and it’s been staged all over the country many times since. The NT reserves the right to mount a professional production of any play it commissions. But if it doesn’t, then the performing rights for that particular play become available to others. Published in annual anthologies, they are eagerly snapped up, especially by young companies. How does Connections work? Groups apply to take part in the summer for the following year: the closing date for 2017 applications is on July 8. The company I saw – the Marlowe Youth Theatre – regularly takes part. The plays are carefully structured to use flexible numbers in the ensemble, so the texts can work effectively with small and large groups. I saw a preview of the Marlowe’s contribution on its home turf, with a cast of about 30. 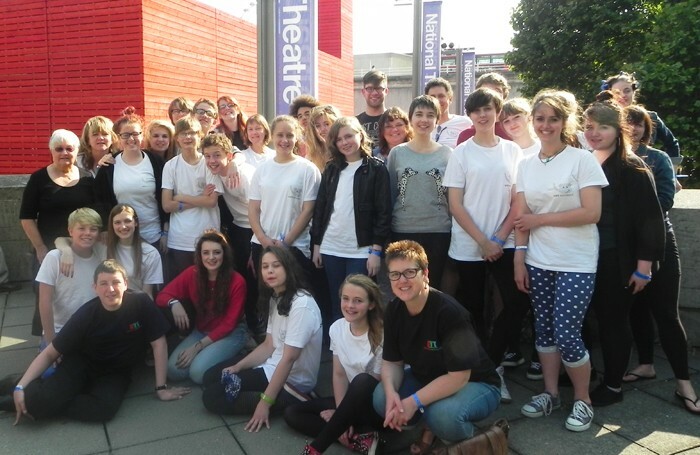 Later, a festival with other local groups performing a range of Connections plays took place there, as the Marlowe is one of the 45 participating hub theatres nationwide. The scheme culminates in a “celebration of hard work” next month, when a version of each of the 12 plays will be selected to be performed at the National itself. Youth theatre leaders and school drama teachers are supported through the process of directing. They choose a script from the commissioned plays – stating a first and second choice – and attend a directors’ weekend in October. Help and guidance are offered throughout the rehearsal period. As the scheme has generated lots of work for professional directors and facilitators, Connections has established a mini-niche for itself. For many people in the industry, NT Connections has been a stepping stone to – or in – training. That is why Rufus Norris, the National’s director, recently appealed in The Stage for those who have been through the scheme in the past to share their stories. Connections as a career launcher? I look forward to reading the contributions. I regularly commend drama schools that actively support recent graduates in the creation of companies and work. East 15 principal Leon Rubin has sent me a list of “spin-off” companies from the school’s BA acting and contemporary theatre course led by Uri Roodner. It includes Rebounding Hail (Disparat Theatre), A+E (Hounded Theatre) and Some Big Bay (The Ugly Collective), all of which did well at the Edinburgh Festival Fringe last year. Two things interest and please me about this. First, when companies are founded by graduates of the same course, they all know each other and the scope for working together is obvious. Hounded and The Ugly Collective, for instance, collaborated on another Edinburgh show last year – Leftovers – and won the Scottish Daily Mail Award. Second, Rubin tells me that East 15 has given £45,000 in grants to support its 2015 graduates in their emerging companies and that there is more money for 2016 graduates to similar things. It is as important – arguably more so – for drama schools to encourage graduates to work in entrepreneurial way as it is to get them signed to agents. Good for East 15.